In 2 Samuel 6 children will learn that God is Just. 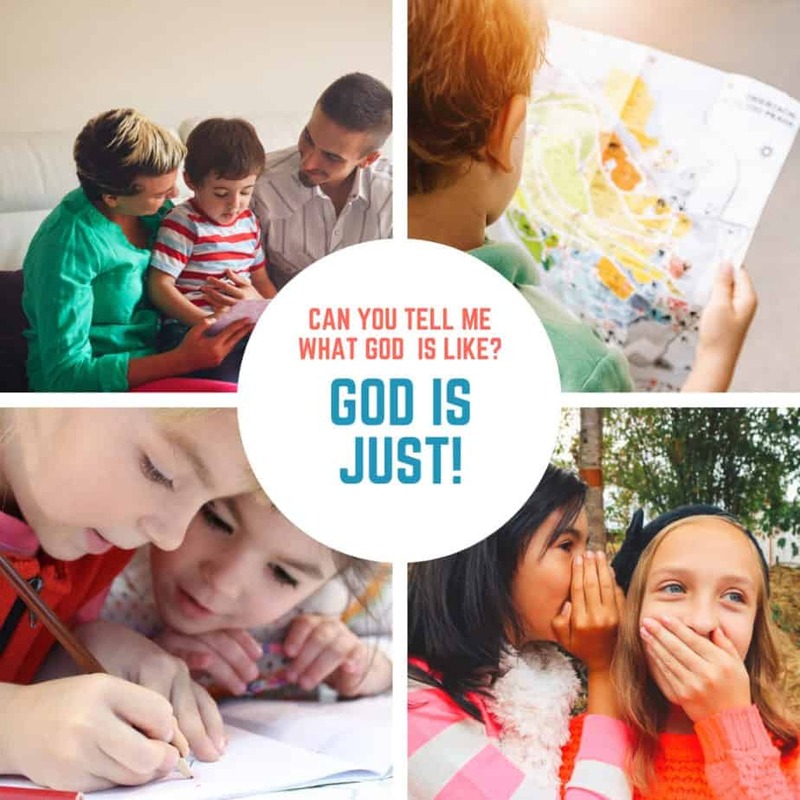 This is lesson 18 of 42 in our study on the Attributes of God called “Can you tell me what God is like?” Visit the series index to view all the lessons and get more ideas for using this curriculum in your children’s ministry. Ask if anyone can remember the truths we’ve learned so far. Choose a few of the attributes and name the attribute for the children to respond with the definition or action, OR do the action and ask the kids to respond with the attribute about God. Start out by reading this week’s memory verse (Psalm 9:16) from the screen. Ask is anyone can define the word just or justice. Talk briefly about how these words usually make us think of a judge or law or a court. Have one of the kids remind you what they learned about last week when they talked about God being the judge. Then, tell the kids that you want to tell them a story from the Bible that that gives us a picture of God’s justice. Back in Exodus 25, God had Moses build a wooden chest called the ark of the covenant. God gave specific instructions for the building of the ark, what would go in the ark, who could come near the ark, how the ark was to be carried, etc. After they built the ark, they placed the stone tablets with the ten commandments, a jar of manna and Aaron’s staff inside the ark. The ark was placed inside the most holy place in the tabernacle and was said to be where God dwelt with His people. No one was allowed to touch the ark, but the Levite priests were to cover it and carry it on special poles when it had to be moved. Time has passed and the ark and God’s law have all but been forgotten. King David decides it’s time to bring the ark back to Jerusalem. So, forgetting all the laws…he does what makes sense to him and sends 30,000 men to go get it and bring it back. The men put the ark on a cart instead of carrying it…it wasn’t Levites moving the ark… Uzzah touched the ark… Uzzah died for breaking God’s law. Uzzah’s death scared David, so he left the ark at someone’s house for 3 months. During these 3 months, David realized his mistake, read the law, prepared a place for the ark in Jerusalem and then went again to collect the ark the proper way. the Levites brought the ark into the tent and offered burnt offerings and worshipped the Lord. EXPLAIN: Ask the kids in the group if they think it was fair for Uzzah to die for touching the ark. Talk briefly about how it’s hard to hear this story because you know that David wanted to honor God y bringing the ark to Jerusalem and Uzzah was only trying to protect the ark by touching it, and yet he ended up dying. How can that be fair. Remind the group of the week you talked about God being holy and completely set apart from sin. It’s God’s holiness that helps us understand His justice in this story. God can’t be in the presence of sin. He gave the rules for moving the ark to protect His holiness. Read the memory verse (Psalm 9:16) a few times together. Talk about how God showed that He is just in today’s story. Remind kids that God is Holy and all of the laws surrounding the tabernacle and the ark were to remind the people of God’s holiness and to help them see their own sinfulness in comparison with a holy God. It may seem harsh that God killed Uzzah for touching the ark, but the people had forgotten God’s holiness and their sinfulness and needed a reminder that God will punish sin. The Bible tells us in Romans 6:23 that the wages of sin is death. That reminds us that the just (or right) punishment for sin is death. As a just God, God cannot let sin go unpunished. We sin and our sin deserves death. Someone has to die for our sin. Thankfully at the end of the story we saw a glimpse into God’s plan of salvation through Jesus. You see, it was in 2 Samuel 7:16 (right after David brought the ark into Jerusalem the right way) that God promised David that someone in His family line would be the forever King. Sin must be punished, but the Forever King would come, He would die in our place for our sin and would reign forever on David’s throne. Give each child a blank piece of paper provide markers or colored pencils. Encourage them to write the word just somewhere on the paper and then write or draw something to help them remember this attribute of God. They could write the definition for just or the memory verse or they could illustrate the story or what we’ve just talked about how God is just to punish sin. .After a few minutes, bring the group back together and give kids time to share what they have drawn or written. Pray that the kids in the group would come to know God more and more each week through this study and that they would remember that all of us are sinners who need to be saved and that they would turn to this good God for salvation. Thank God for sending Jesus to take the punishment that we deserve and for taking God’s just punishment on Himself. Filed Under: 2 Samuel, Lesson Plans, What is God Like?